Flerovium is a synthetic element that was discovered in 1999. It is an extremely heavy and highly radioactive element. Dmitri Mendeleev predicted the presence of element 114 and it was named eka-lead. 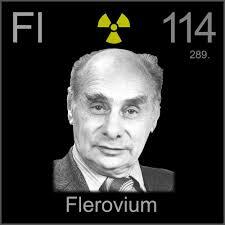 Flerovium was synthesized team of physicist led by Yuri Oganessian working in Joint Institute of Nuclear Research (JINR), Dubna, Russia in 1999 . They bombarded plutonium-244 with calcium-48 nuclei and produced a single atom of flerovium-289. Long before its discovery, isotopes of flerovium were predicted to lie in the island of stability (elements from copernicium (112) to oganesson (118)) and with magic number of protons and neutrons, 114 protons and 184 neutrons, after helium-4, oxygen-16, calcium-48 and lead-208 which are the other members of the doubly magic atomic numbers group. It has proposed that the nuclei flerovium would be oblate and deformed which would attribute to its resistance to spontaneous fission. And in 1972, it was proposed that flerovium-298 would have a half-life of around a year. The name of the newly discovered element was confirmed as flerovium by International Union of Pure and Applied Chemistry in 2012, after the Flerov Laboratory of Nuclear Reactions of JINR, Russia. The laboratory was named after a Russian physicist, Georgy Flyorov . Its symbol is Fl. Flerovium is an artificial element and does not exist in nature. Around 90 atoms of flerovium have been made so far. Flerovium is predicted to be a gas at room temperature. Flerovium is expected to be present in the carbon group (Group 14) along with silicon, tin, germanium and lead. Its boiling point is lower than other members of group 14, around -60 °C. and the melting points is also low, i.e. 70 °C. Flerovium crystallize in a cubical structure that is face-centered. In solid form, flerovium is an extremely heavy element and would have a density of 14 or 22 g/cm3 . The outermost shell of flerovium is filled and thus makes it a noble (inert) metal. It has no electron affinity. The first ionization energy of flerovium is expected to be the highest among its group. And its electronegativity would also be higher than lead. It is also the heaviest member of the periodic table. Other members of carbon group form stable compounds with +4 oxidation state but flerovium is expected to be most stable at an oxidation state of +2 and 0 . Due to its short life span and relativistic effects, the chemical and physical characteristics of this element are yet to be determined. Flerovium does not have any industrial applications is used for research purposes. Flerovium is a radioactive element and requires special precautions with handling and storage. There are seven isotopes of flerovium, however some of them are still unconfirmed. They are unstable and unnatural. The most stable isotope of flerovium is flerovium-289 with a half-life of 2.6 seconds .
. Hoffman, Darleane C.; Lee, Diana M.; Pershina, Valeria (2006). “Transactinides and the future elements”. In Morss; Edelstein, Norman M.; Fuger, Jean. The Chemistry of the Actinide and Transactinide Elements (3rd ed.). Dordrecht, The Netherlands: Springer Science+Business Media. ISBN 1-4020-3555-1.
. Oganessian, Yu. Ts. ; et al. (2000). “Synthesis of superheavy nuclei in the 48Ca + 244Pu reaction: 288114″ (PDF). Physical Review C. 62 (4): 041604. Bibcode:2000PhRvC..62d1604O. doi:10.1103/PhysRevC.62.041604.